The FEI has declined to review a controversial endurance fatality in Bahrain, despite new evidence suggesting both the dead horse and the ride were wrongly identified. A grey French-bred mare, Samba d L’Ile, was belatedly named by the FEI after liaison with the Bahrain equestrian federation. But now ride start lists have emerged, which appear to show that Samba was not a participant on March 4th. This raises new questions about the scope of the FEI investigation, especially in the light of its emphasis on the monitoring of Catastrophic Injuries (CIs): attrition was a major topic at the FEI Endurance Forum in Spain earlier this week. The Bahrain saga dates back to distressing videos of a grey horse at the moment it broke its foreleg. They were posted on April 3rd by an outspoken blogger known only as “Fair Endurance,” who has been active for the past year, and has clear UAE sympathies. The clips also showed the horse – whose rider was unseated – valiantly trying to follow the rest, stumbling along on three legs while other riders did nothing to help. The blogger did not identify the horse, but claimed the fatality occurred during the King’s Cup 120km CEI on March 4th and was not recorded in FEI results – an alleged breach of FEI rules. “Fair Endurance” also alleged that other CIs in Bahrain have gone unrecorded. The videos went viral, leading to strong criticism on social media of the FEI and of one of its most senior judges, Dr Mohammed Ibrahim Al Hammad of Saudi Arabia. Dr Al Hammad was FEI Foreign Veterinary Delegate in Bahrain, where his responsibilities included immediate reporting of any fatalities to FEI HQ. Members of the “clean endurance” community – which is not connected to “Fair Endurance” – then set about identifying the dead horse. They scrutinised hundreds of images, cross-checking all other participants against bib numbers and colours, and in and out times at the vet-gates in the publicly-available CEI results. They concluded the victim was most likely white bib number 18, Qalipso de Kerbreden, owned by the Royal Endurance Team of Bahrain. He was one of six horses recorded as Failed to Complete (FTC) in the King’s Cup CEI 120km; he completed the first loop at an average speed of 25kph. A separate investigation by European news organisation Grand Prix Replay came to the same conclusion, publishing their findings on April 8th. However, three weeks later the FEI announced that the dead horse was Samba d L’Ile, from the 80km CEN, which was on the field of play alongside the King’s Cup. A FEI spokesman said Samba – who had not competed in FEI since November 2015 – as correctly noted as CI in CEN results. As that ride fell outside FEI jurisdiction, FEI officials had done nothing wrong. A FEI spokesman said at the time: “The FEI fully investigated the Bahrain fatality, including consultation with the relevant officials and liaising with the national federation. We are satisfied that the incident, whilst no less tragic, took place during a CEN. It has since emerged that, after seeing the videos, the FEI provisionally suspended Dr Al Hammad on April 6th for his alleged failure to uphold FEI rules, but reinstated him on April 13th. 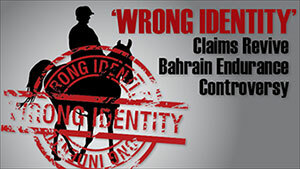 However, both the FEI and the Bahrain national federation declined to show the CEN results to members of the media who asked for proof that the CEN had taken place, for it was not mentioned on the calendar on the Bahrain NF’s website. The Bahrain NF advised their national rules – also unpublished – prohibit publication of national competition results. The FEI also declined to elaborate on steps taken to authenticize documents supplied to them. But on Thursday (May 25th), Fair Endurance published what they claim is the hitherto unavailable start list for the CEN 80Km. Samba is not listed. They too have now named the dead horse as Qalipso de Kerbreden. Horse-Canada.com asked the FEI if it would re-investigate in the light of the new claims, but a FEI spokesman said “there is no change to the FEI position on this,” and that media should put any further questions direct to Bahrain. Horse-Canada.com invited the both original poster and the Bahrain federation to comment on the latest developments, with no response as yet. The “clean endurance” community believes that Middle Eastern horses often escape inclusion in FEI field-of-play death statistics by being recorded “FTC” before being shipped off-site for euthanasia. Two horses declared “FTC” at Al Wathba in the UAE in December – Shikara la Marjorie and Moon’s Sundance – were updated as dead on the FEI horse registrations database the exact same day, but without their ride results being amended.